Velocity® high flow nylon long fiber composites from PlastiComp utilize a proprietary chemistry to reduce viscosity and allow composites highly loaded with long glass or carbon fiber reinforcement to be easily processed. Composites with high fiber content can be problematic to process due to their high viscosity. Long flow lengths, especially in thin wall sections, can freeze off before completely filling. Higher processing temperatures and higher injection pressures, usually the prescribed remedies, result in longer cycle times and fiber length attrition. With Velocity wall sections of 0.075” (2 mm) or less flow up to 30% further; molds can be completely packed out with 40% less pressure at 30–40 °F (17–22 °C) lower temperatures; resulting in cycle time reductions of up to 25% – creating savings that decrease operational costs for processors and per part costs for OEMs. 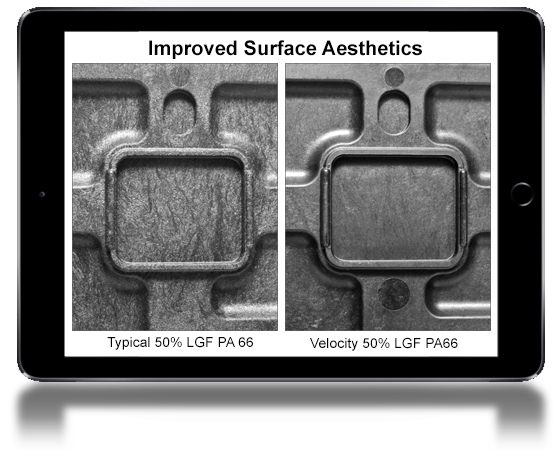 Velocity achieves these flow advantages at an equivalent level of mechanical performance expected from long glass or carbon fiber reinforced nylon 6 and 6/6 composites. You will be able to deploy new designs with thinner wall sections or shapes that are more complex and utilize less material by taking advantage of the expanded performance envelope higher fiber loadings provide. Aesthetically, Velocity produces a resin rich surface free of fibers that results in richer color and smooth glossy surfaces can be achieved in polished molds. The ability to mold high fiber content materials and obtain cosmetically defect-free components will minimize secondary finishing operations. By giving you the means to fill thin walls with ease – and look good doing it – Velocity will enable you to use long fiber reinforced nylon composites with confidence. Velocity long fiber composites are available in nylon 6 and 6/6 polymers reinforced with glass, carbon, and other specialty fibers. 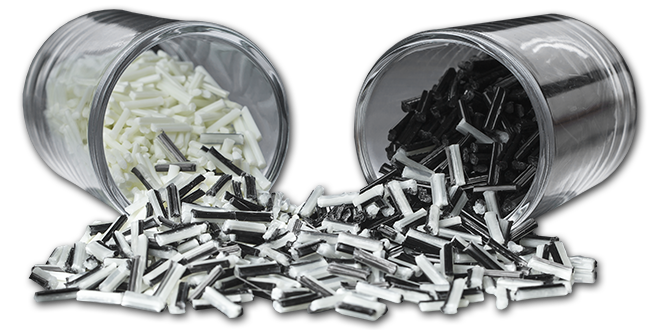 PlastiComp can tailor the performance of our long fiber products to meet your specific application requirements.